MS Dhoni, Virender Sehwag, Sachin Tendulkar, Gautam Gambhir, Virat Kohli, Yuvraj Singh, Suresh Raina, Piyush Chawla, Zaheer Khan, Munaf Patel, Ashish Nehra, Praveen Kumar, Harbhajan Singh, Ravichandran Ashwin, Yusuf Pathan. Above are the 15 players on whom five men selection committee led by K.Srikkanth have put in faith to win ICC Cricket World Cup 2011. Now this 15 men squad have to carry the burden of billion people's dream of winning the ICC Cricket World Cup 2011 for next 3 months. I feel selectors have picked up near perfect squad and this squad is picked up according to the conditions of sub-continent and thats why selectors have picked up 3 spinners in Ashwin, Chawla and Harbhajan. It is good that this ICC Cricket World Cup is happening in sub-continent and our players will get lot of home support to win it. I feel it is correct decision but to me back-up wicket-keeper is also essential because Dhoni is carrying few finger injuries and if something happens to him during the tournament then I don't think so anybody else can do keeping. In last 2 World Cups we had services of Rahul Dravid but this time he is not around so who will keep wickets if Dhoni gets injured before any key match. 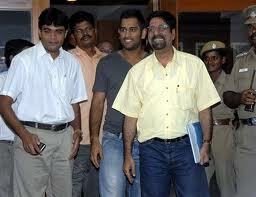 I feel instead of Ashwin if selectors had chosen Parthiv Patel then it would have been considered more wise decision. Although Ashwin is very good bowler and deserves the place in the side but we have too many off-spinners now. Sachin,Raina, Pathan and Bhajji can bowl off-spinners, so additional off-spinner is not required. Over all I feel team is good and I hope they bring glory to the country by winning ICC Cricket World Cup and make our dream true. The ICC has announced the schedule for the 2011 World Cup of Cricket. This tournament will be played in the Indian sub-continent, with India, Sri Lanka and Bangladesh as the hosts.